The worlds smartest mobile browser is now also the worlds most social browser! 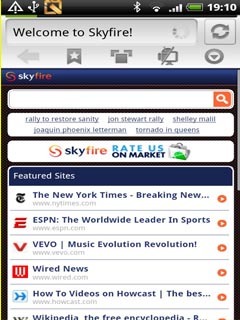 Experience the world's hottest mobile browser with Skyfire for iPhone. Available now in: US, Canada, UK, Ireland, Australia, New Zealand und Deutschland! Move to SD Card: FroYo Android OS 2.2 and later devices. Improved Download Workflow: File download will happen in background and notification will be automatically placed in the system tray. upload file FroYo Android OS 2.2 and later. Please seach Skyfire 2.3 for Android which works on most 1.x devices. Skyfire Web Browser For Androi..
Skyfire Web Browser For Window..